Greetings again from the darkness. Rare is the film that casts a kid in the lead role and then features him in most every scene … often with only him and a toddler on screen. It’s even rarer when that kid is a first time actor, and the film gets nominated for an Oscar (Best Foreign Language film). 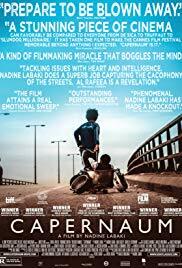 Each of these come to pass in the latest from writer-director Nadine Labaki (CARAMEL, 2007), with a script she co-wrote with four others: Jihad Hojelly, Michelle Keserwany, Georges Khabbaz, and Khaled Mouzanar (Ms. Labaki’s husband, who also produced the film’s music). The film opens in a courtroom setting which acts as a framing device for a story that is told mostly through flashbacks. Zain (Zain Al Rafeea) is asked by the judge why he is suing his parents. His answer: “Because I was born.” Zain is an undernourished 12 year old Lebanese slum-dweller who lives with his parents and an indeterminate number of brothers and sisters. Zain is particularly close to his 11 year old sister Sahar (Cedra Izzam), and the two work odd jobs on the streets to bring home money and food for the family. When Sahar comes of age, Zain knows this spells change, as their parents view her as little more than an asset that can be traded for chickens. When this happens, an angry Zain runs away from home. Zain’s adventure takes him from the slums to shantytown, where a kind-hearted, poverty stricken single mom takes pity on him. Rahil (Yordanos Shiferaw) is an undocumented Ethiopian who works multiple jobs while hiding her toddler Yonas (so freaking adorable). In exchange for food and shelter, Zain agrees to babysit Yonas while Rahil works. The two young boys become like brothers, and when Rahil doesn’t return home, Zain’s street smarts kick in. He reverts to the lessons of his previous life and begins literally scrapping for scraps. His ingenuity is inspiring, as is his full-blown survival mode … all while caring diligently for Yonas. In the courtroom, director Labaki appears as Zain’s attorney, but it’s the young actor who carries the weight of the film. He is truly remarkable to watch, whether he’s interacting with other street hustlers, conversing with “Cockroach Man” on the bus, or in that final freeze-frame ending, Zain steals our heart. The film is not dissimilar to SHOPLIFTERS, the Japanese film also nominated for Best Foreign Language Oscar this year. The title means “chaos” and it begs the question, without paperwork, do we exist to society? Ms. Labaki manages to put a pretty face on a tragic environment, and offer up a rare matter-of-fact melodrama on the hardships for children in poverty. This entry was posted on Thursday, January 31st, 2019 at 9:17 pm and is filed under Drama, World Cinema/Foreign. You can follow any responses to this entry through the RSS 2.0 feed. You can leave a response, or trackback from your own site.